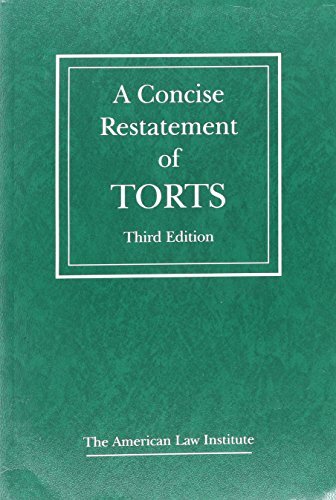 This abridgement of the American Law Institute's Restatement of Torts (2nd and 3rd), which has been cited by the courts almost 80,000 times, is intended primarily for use in law school torts courses as collateral support for the main casebook. The central ingredient of this compilation, assembled and edited by Dan B. Dobbs Professor of Law Ellen Bublick of the University of Arizona, is the Restatement of Torts, 3d - Liability for Physical and Emotional Harm, completed in 2011. Strong content contribution comes also from Torts 3d Products Liability (1998) and from Torts 3d - Apportionment of Liability (2000).